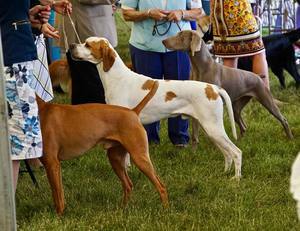 The Putnam County Kennel Club brings dog lovers the annual Putnam County Kennel Club Dog Show! Hundreds of dogsand their owners will get the chance to strut their stuff in the show ring Friday and Saturday, July 20th and 21st at the Putnam County Veterans Memorial Park, 225 Gipsy Trail Road, Carmel, NY 10509 from 8:30 AM to 4:30 PM each day. The event is great for the whole family with free admission. Meet and greet a variety of different dog breeds. Visitors can learn about responsible dog ownership and speak with breeders, owners and handlers. Watch the judging of various breeds in Conformation and cheer for your favorite. See young owner-handlers compete against their peers in the Junior Showmanship Competition. Obedience and rally trials will test dogs understanding of commands, as they maneuver hurdles & retrieve articles. Watch owner-handlers compete in a special series called the National Owner-Handled Series. These exhibitors are striving for a spot in the finals at the AKC National Championship presented by Royal Canin in Orlando in December.